Barbara Bush was an amazing woman in many respects. Not only is living to 92 a remarkable achievement, she and her husband, President George Bush Sr., were married 73 years-- that is an historical record--the longest US-presidential marriage! Also, just being a First Lady is remarkable, by being married to a US president. However, what is more, Barbara Bush was not only a First Lady, but also mother to another US president, George W. Bush. (George W. Bush was a two-term president, elected in 2000, who served from 2001-2009.) In all of US history, only TWO women have been both a First Lady AND mother to a president. The other one was Abigail Adams, wife of the United States' first Vice President and second president, John Adams, and mother to sixth president John Quincy Adams. Mrs. Bush's son, Jeb, former Governor of the US State of Florida and former candidate for president, said he and his mom spoke about her feelings about death, the last time they met. This is what she told her son: "Jeb, I believe in Jesus and he is my savior. I don't want to leave your dad but I know I'll be in a beautiful place." Read more about their last conversation here. Do you know what Barbara Bush meant when she told her son, "I believe in Jesus and he is my savior"? Find out here in English, simplified Chinese, or traditional Chinese. In the USA, when a very famous person dies, or there is some terrible tragedy like 9-11 or such, the flags are flown at half-mast to represent a nation in mourning. When Barbara Bush passed away, many flags at post offices, stores, and even private homes were flown at half-staff. The week she passed away, a young man from Germany came to visit us here in Virginia. He said they do not have that tradition in Germany, and this was his first time to see it done. Below is the flag at a Chick-fil-A restaurant at half-staff, in honor of Mrs. Bush. The Titanic was built by professionals. The Ark was built by volunteers. Giving frees us from the unfamiliar territory of our own needs by opening our mind to the unexplained worlds occupied by the needs of others. The funeral for Mrs. Bush was held on April 21, 2018, in Texas. Because of her fame, many dignitaries attended her memorial service, including this photo that shows President Bush Sr., President Bush Jr. and his wife, Presidents and Mrs. Clinton, President and Mrs. Obama, and Mrs. Trump. It shows how American leaders came together at that important moment. She was beloved by the Secret Service agents who protected her and her family. Read one agent's account here. Some Election Reflections--Does character count, or not? I write this on the afternoon of Monday, November 7, 2016. The beautiful Virginia sunlight is streaming in my office windows from the west, so I know the day will soon be over. Tomorrow is a big day, not only for the US, but for the world. The US will choose it next president, one-third of its US senators, and all its members of the House of Representatives. In fact, the voting starts in just over eight hours, when three towns in tiny New Hampshire vote at midnight. Because of the US's unusual way to pick a president, the Electoral College, the actual contest comes down to about 10-15 "swing states." In other words, about thirty-some states are highly Democrat or Republican, so we are quite sure how they will vote. (Find out more about the Electoral College and how the US picks a president in my blog post. Therefore, the remaining 10-15 "swing states" are toss-ups, and how they go, will probably determine the outcome of the election. The state where I live is Virginia, one of these "swing states." Much is at stake in this election, too much to even go into here, but one of the biggest issues is the future of the US Supreme Court. (Learn about this issue in my post.) Simply put, elections are about choices, and elections have consequences. A number of thoughts have been on my mind about this election, and here are a few. Character counts-- (or at least, it's supposed to) A major issue in this campaign, especially in the past few weeks, is "Donald Trump is a reprobate. He has said and done nasty, offensive things!" (Because I want my blog to be "family friendly," I am keeping things vague.) Yes, Trump has done and said nasty, offensive things. That was a major reason why, when I voted in the spring 2016 Virginia primary, I voted for someone other than Trump. But think about it: a person would have to be living under a rock to be suddenly surprised in autumn 2016, "Donald Trump is offensive!" For a man who has been married three times and made his fortune building casinos, (among other things), are you expecting a moral role model? I have lived long enough to remember the election of 1992 well, Bush Sr. vs. Bill Clinton. I was living in Taiwan, but I care enough about my country and US citizenship that I registered early to vote by absentee ballot. Ironically, some of the same accusations about Trump now were made about Clinton then, only many of the charges were more serious. Now, yes, the media did report on some of those issues, but the tone was entirely different. Rather than a shocked response: "this man is a reprobate and cannot be allowed near the White House," we get an entirely different line: "Who are we to judge his private life?" We are electing a president, not a priest, all that matters is how he does his job. All we care about is the economy, economy, economy.In fact, when people did question or oppose Clinton's bad behavior in the 1990's, the overall response was: "You can't force your views on the rest of us. You're just an old-fashioned prude. Catch up with the modern times. This is 1992!" So, with a number of women accusing candidate Bill Clinton of immoral or even illegal behavior, where was his wife Hillary? The idea of feminism says, "Trust the woman, not the man," and "A woman should never tolerate bad behavior from a man." But when these women brought accusations against husband Bill, wife Hillary went into attack mode, with her and her allies calling those women terrible names and destroying their reputations. Let's take it one more step. Agree, if you will, the media are truly upset at Trump's immorality. Okay. Let's say Trump's running mate, Indiana Governor Mike Pence, were running for president. If Trump's immorality is offensive, then Pence, who is a devout Christian and has been married to his wife all along, would be the media's darling, right? Actually, WRONG. 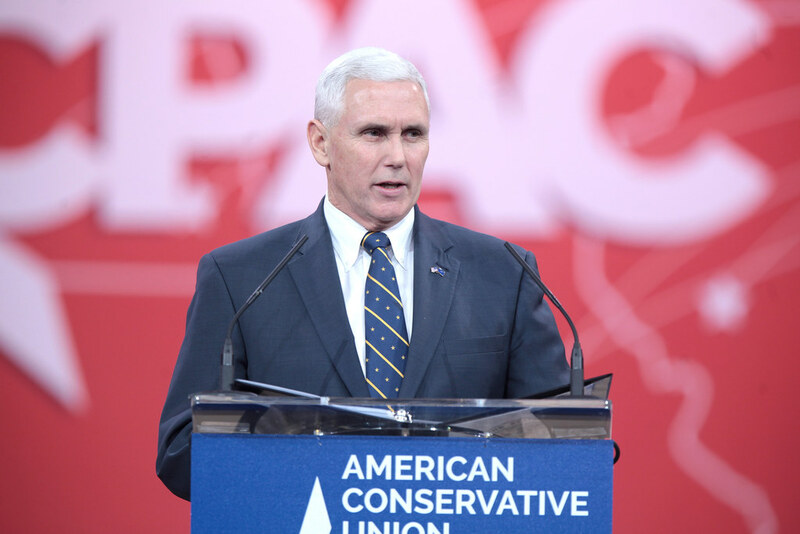 If Pence were running for president, I can hear the headlines and attacks now: right-wing zealot, religious fanatic who wants to cram his beliefs down our throats, he wants to create a theocracy, etc. In 2012, the Republican candidate for president was Mitt Romney, a devout Mormon. If there was ever a "squeaky-clean" man running for president, it was Romney. So did the media glorify him for his high moral standards? No. He was demonized as the out-of-touch rich man who would fire your grandmother if he could make a buck. Last on this point: how ironic to hear the media pretending to be shocked by immorality. This is the same media industry that pumps out movies and TV shows constantly glorifying immorality. One night I was watching the evening news on NBC, and the lead story was basically "Trump as reprobate." The news was over and I went into another room, but the TV was still on. It was running some "entertainment" NBC show I never watch, but overheard the announcer talk about someone being "buck naked." Hmm...I thought. At 6:30 on NBC, immorality is a cause for shock, but by 7:00, it's all business as usual! Vote 2016: Elections have consequences! Unless you have been living under a rock, you know that the USA is having a high-stakes race for president now, with the election to be held on Nov. 8, 2016. Not only is this election important for the future direction of the US, but it is, directly and indirectly, to much of the rest of the world. Several of my students in Taiwan have told me this week they watched part of the debate first debate this week. However, this year the drama is even higher because we have the first-ever woman candidate for a major party Hillary Clinton, Democrat) versus an iconoclastic billionaire new to politics Donald Trump, Republican). If US politics seem confusing for many Americans, imagine how strange is must seem for many people outside the USA. In this post, I will try to give you a clear overview. How does the USA choose a president? In short, it's confusing. The US is the only country in the world that uses the Electoral College to select a president. In other words, when you vote, you do not vote directly for the presidential candidate. Instead, you vote for "ELECTORS FOR" the candidate of your choice. This topic itself is confusing, but I will try to explain. When the USA was new country, around 1787, the idea of letting "We the people" have the ultimate political power and choose our leaders was a revolutionary idea. The Founders were walking a tightrope: they wanted to create a democracy, but knew that crowds can be fickle, and so they did not want to create a PURE democracy, where each person got to vote on each issue. So, they set up a system where voters (originally white males who owned property) could vote to choose some representatives, and those representatives would then vote to make laws. In other cases, there were "buffers" or "guardrails" against the voters having too much direct power. (So, the US is not so much a democracy, but a democratic republic). This is where the Electoral College comes in. Rather than voters choosing the candidate directly, they vote for the ELECTORS, who in turn vote for their party's candidate if he or she carries that state. In addition to being a "check" on an out-of-control pure democracy, the Electoral College was a protection for the small states. Think of the USA in 1787, when the Constitution was new. Small states like Rhode Island or Delaware were fearful of big states (like Virginia or New York) totally absorbing them politically, so the Electoral College, with its "winner take all" set-up for votes, was a protection for smaller states. To put it another way,the Electoral College is not only voters choosing a president, but it is actually STATES choosing a president too. This video tells you more. So what does this means today? In the USA today, there are 50 states. Voters in each state can vote for president. 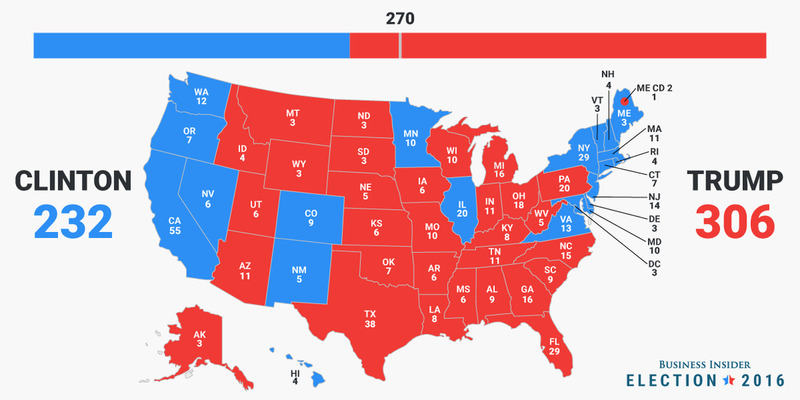 Whether a candidate wins a state by a small or large margin, he or she "wins" that state, and ALL its electoral votes. This is called "winner take all." (Two exceptions: Maine and Nebraska, which can split electoral votes.) However, since some states (ie. California, Massachusetts) are strongly Democrat, there is really no drama or suspense there. Those states have voted for the Democrat candidate for the past several decades, so it is a sure bet the Democrat, Hillary Clinton, will carry those states. SO, Clinton does not need to visit those states to win voters (unless she wants to fund-raise from some millionaires there), and Trump will not go there either, because it is a waste of his time. In contrast, some other states (ie. Oklahoma, Wyoming) are strongly Republican, so there is no drama there either. Trump need not visit, because he will win it regardless, and Clinton will not visit, because she will lose either way. This map shows you how the states stand now: blue is Clinton-leaning, red is Trump-leaning, and grey is toss up. What do those electoral numbers (votes) on the map mean? Those numbers are the "electoral votes." In my view, the Founders were geniuses in how they distributed power among the states when the USA was a new country. Small states wanted an equal voice, so each state got two seats in the US Senate, whether it was a big or small state. In contrast, big states wanted more power based on their bigger populations, so states got seats in the House of Representatives based on their population. So, the Electoral College is a mix of these two plans. Each state has one electoral vote, based on their number of seats in Congress. So, since each state has at least two Senate seats, they get at least two electoral votes. And, since even the smallest states have at least one member in the House of Representatives, that means all states have at least three electoral votes (2+1=3). So, states like Alaska, Montana, and South Dakota, despite their large areas, have tiny populations, so they have three electoral votes each. On the other hand, the most populous state, California, has 53 seats in the US House, plus two senators, so they have the biggest number of electoral votes, 55 (53 + 2). The fact that California is a solid 55 is a huge advantage to the Democrats. The second-most populous state,Texas, with 38, leans Republicans. How many electoral votes does it take to win the White House? The Twelfth Amendment to the US Constitution puts that at 270, since that is a majority of the 538 electoral votes total. Remember that number, 270. That is the number of electoral votes to win the White House. Is it possible to lose the popular vote, but win the Electoral College? If so many states are strongly Democrat or Republican, where is the "drama" of this race? At this point, in 2016, about 30-some states tend to be strongly for one party or the other. In other words, those states have voted either Democrat or Republican each time in the past four or five presidential elections. The drama comes from the remaining 10-12 states. These states have, in the past four presidential elections, gone for the Democrat some times and the Republican at other times, and the margin of victory is often very small. So, these states are sometimes called "battleground states," "swing states," or just "toss ups." Interestingly, my home state of Virginia, and where DreyerCoaching.com is headquartered, is one of these "swing states." For more than 100 years, Virginia was part of the "Solid South," which meant it was heavily Democrat, since even before the US Civil War. However, the last Democrat to carry Virginia from that era was Lyndon Johnson, who won Virginia in 1964. Starting in 1968, however, due to the national Democrat Party becoming more liberal, Virginia went for Republican presidential candidates, without fail, for almost 40 years! The Democrats finally broke their losing streak in 2008, when Democrat Barack Obama carried Virginia, thanks largely to the huge population and changing demographics of the Washington DC suburbs of Northern Virginia. So, George W. Bush (Republican) won Virginia in 2000 and 2004, while Obama (Democrat) did so in 2008 and 2012. That makes Virginia a "swing state." Many observers believe this was a main reason why Hillary Clinton chose Tim Kaine, a US Senator from Virginia, to be her running-mate. She probably figured that adding Kaine to her ticket would help her put Virginia in the bag. So far, polls show Virginia to be a toss up. Virginia's neighbor, North Carolina, is a battleground state too: Obama won it in 2008, but lost it in 2012. So, it may seem strange, but this election will be decided by how those dozen or so swing states vote, and that is why so much media attention focused on them, and why the candidates visit those few states over and over, and largely ignore the other 30-some states! Are these "swing states" all of equal importance? The likely answer is, "no." As I mentioned in #3 above, states have different numbers of electoral votes, so the bigger the state, the bigger the "prize" and the more important it is to win. And several "swing states" are huge. Florida, with 29 electoral votes, is the largest battleground state. When George W. Bush narrowly won Florida in 2000 with just a few hundred votes, he won ALL that state's electoral votes, and thus the election. In 2004, Bush carried Ohio with 80,000 some votes, but that gave him ALL the Ohio electoral votes, and thus his reelection. In contrast, tiny New Hampshire has only 4 electoral votes, but in a very close election, that could be the margin of difference! Wouldn't that be crazy: the entire US presidential election being decided by one tiny state like New Hampshire? It is possible! If Virginia is a battleground state, is Southwest Virginia a crucial area? Yes. Look at the evidence. Last summer, when Trump named Indiana Governor Mike Pence as his running mate, their first joint-appearance was in Roanoke, Virginia, my hometown. Just last week, in the last appearance before their Monday debate, Trump visited Roanoke again, this time to a sell-out crowd of 10,000. As mentioned above, the Washington DC suburbs of Northern Virginia are becoming more and more Democrat, thanks to many people from out of state and other countries moving in. So, for Trump to carry Virginia, he will need to run up big margins in rural Western and Southside Virginia. Elections are exciting, and it is exciting to live in a "battleground state" now-- you feel like you have a front row seat to a national drama. What are some key points Trump made during his speech? This is not baby food. So this is why I write this post, to address a key issue of the 2016 US presidential election. Ironically, it is about some people's names NOT on the 2016 ballot, names probably most of us have never heard of...yet. The topic: the US Supreme Court (aka SCOTUS). This has been a major issue for years, and it bothers me that few seem to be aware of it as a critical election issue. However, this year I have heard more people discuss it than ever before, so I hope that is a healthy trend. People are realizing the crucial importance. When the founders established the US and its Constitution in 1787, they wisely set up a government of three branches. That way, no one person or group could (easily) get total control of the government and set up a dictatorship. This system is called "Balance of Powers" or "Checks and Balances." (There is actually a slight difference between these two systems, but to keep it simple for our purposes today, we will place them together.) Of course the USA's system is not perfect--none is--but the US is still using the Constitution written in 1787: at 225+ years, the longest-used Constitution of any country anywhere, and the American system is still in many ways the envy of the world. (Just think: more people are trying to get into the US--even risking their lives to enter--than escape fromit.) So, for all our problems, the US is still a beacon and model for much of the rest of the world. Since the Judicial branch is one-third of the US federal government, and since that branch is headed by a Supreme Court of only nine judges (an odd number makes a tie vote unlikely), I hope this shows you the crucial importance of those nine people. (In contrast, the US Senate has 100 members and the House of Representatives, 435). So, how does this relate to the president? This topic is not "baby food," so let's go step by step. Presidents have great powers, and a key power is the authority to name (appoint) all federal judges. (A president can only name a judge whenever there is an opening due to the death or retirement of a sitting judge.) This is a clear example of what I mentioned above, "Balance of Powers" and "Checks and Balances." Yes, this includes openings on ALL federal courts, and since SCOTUS is the highest court with the most power, then naming a judge to that bench carries great importance. When the Constitution gave the president the power to name new judges, it thus gave the Executive Branch a key "chokehold" over the Judicial Branch. Note: The Constitution framers, in their wisdom, did not give the president absolute power over new judges. Yes, the president names all new judges. But, the Constitution also requires the US Senate to approve all new judges by a majority vote. In what I see as a further example of genius and foresight, this gives half the Legislative Branch (the Senate) "checks and balances" over the Judicial Branch. Why is this important to me? So what? Timing. I write this for you in 2016. Whoever wins the White House, Clinton or Trump, by the Constitution, will have only four years in office, then face the voters again. If he or she runs again and wins, he or she has eight years in office, total, and no more. Congressmen have no total time limit, but Senators face reelection every six years, while House members do so every two years. In contrast, federal judges have NO term limit. They sit on the bench, with their safe government job, pension, healthcare plan (ironically not Obamacare), and enormous power, until they retire...or die. There is practically no way to remove them from office. (Yes, the Constitution allows an impeachment process for judges, but like any impeachment process, it is slow and cumbersome, and in all US history, it has been used less than a handful of times.) So, love it or lump it, a new federal judge has the potential to sit on the bench--and make rulings that directly affect you and your liberties--for much of the rest of your life. Example: In Feb. 2016, a member of the Supreme Court, Antonin Scalia, suddenly passed away while on vacation in Texas. President Reagan appointed Scalia to the Supreme Court in 1986, with 98-0 Senate approval, thus making him the first Italian-American to serve on the high court. Scalia ended up serving on the bench during the Reagan, Bush Sr., Clinton, Bush Jr., and Obama Administrations. I want to staple this idea to your brain: Reagan put Scalia in office when I was a college student, and he served in that position till his death when I was a grandfather. In other words, this is a legal way for a president to extend his legacy and influence. Reagan placed Scalia on the Supreme Court in 1986, half-way through his second (and last) term. Even though Reagan left office in January 1989, later got Alzheimer's, and died in 2004, his influence lived on via Scalia's writings and rulings, until 2016. Lack of democracy. The Judicial branch is the least democratic of all three branches. Here's why: all 535 members of Congress are elected directly by voters, and must face reelection every so often. Presidents are (almost) directly elected by voters via the Electoral College, and also face re-election after four years. But federal judges are different. 1. They are never chosen directly by voters; the president names them, and the Senate must approve by a simple majority vote (usually not hard to manage). 2. Unlike Congressmen or the president, they have no "term limit" where they must step down or face reelection. To put it another way: if you do not like your Congressman or president, you can call their office, picket, write a letter to the newspaper, vote against them next time, etc. But if you don't like a judge or his or her rulings? You're stuck. To be fair and give context: the founders knew crowds to be fickle and maybe even dangerous (that's why the Founders established the Electoral College, different reelection years for members of the House and Senate, etc., to level out and compensate for the "mood swings" of the masses.) So, since judges did not need to face voters or have term limits, the hope was that they would be more fair-minded and make correct judgments, without regard to their popularity or the pressure of facing reelection. Jefferson's warning. He wrote in 1804 to Abigail Adams: "the opinion which gives to the judges the right to decide what laws are constitutional and what not, not only for themselves in their own sphere of action but for the Legislature and Executive also in their spheres, would make the Judiciary a despotic branch." http://founders.archives.gov/documents/Jefferson/99-01-02-0348 The concern was, if judges become too powerful over time and cannot be removed, they might become "tyrants in black robes." Is it possible to guarantee how a judge will vote in the future? No. As mentioned, once a judge is in place, he or she can decide cases any way he or she wants to. So, before a new judge is appointed, the only thing we have to go on is his or her record. We can know this record based on what the judge has written, said in speeches, or how he or she has decided cases in the past. These records can be an indication, but they are no guarantee, how the judge will rule on future cases. A clear example of this is retired Judge David Souter. George Bush Sr. ran for the presidency as a conservative, and millions of conservatives voted for him. In 1990, Pres. Bush Sr. named him to the US Supreme Court; the Senate approved him by an overwhelming 90-9. However, not long after being on the court, he established a liberal voting record which he kept till he retired in 2009--after nineteen years on the high bench. (As further proof of Souter's liberal record: He stayed in office during all eight years of the Bush Jr. (conservative) administration. If he had retired then, Bush Jr. would have tried to replace him with a conservative. Instead, he retired in 2009. That was not a coincidence. Pres. Obama (liberal) had just been swept into office, so Souter knew Obama would name a liberal judge to replace him. Plus, in 2009, the Democrat Party (liberal) had an overwhelming majority in the Senate, thanks to Obama's 2008 landslide victory. That guaranteed any judge Pres. Obama named would get easy approval, and it happened, when liberal Judge Sonia Sotomayor was approved. Is the US Supreme Court as divided as the American people? Yes. As mentioned, the Supreme Court has nine justices, so as to avoid tie votes. And for over the past twenty or more years, <em>many</em> key court cases have been decided by 5-4 votes! Let me explain. During those past twenty years or so, the Supreme Court has had four liberal judges, who usually vote together; four conservative judges, who usually vote together, and one "swing vote." In other words, since there is often a liberal and conservative view or position on any key issue (abortion, gun rights, religious liberty, freedom of speech, etc. ), then we can be reasonably certain, going into any case, how eight of the judges will decide. The four liberal judges will (usually) take the liberal position, and the four conservative judges will (usually) take the conservative position. So, that single "swing vote" basically has the power to decide the outcome of any Supreme Court decision. If he votes with the liberal bloc, they win 5-4, but if he votes with the conservative bloc, they win 5-4. So, lawyers going to argue a case before the Supreme Court often pitch their entire argument to that one judge.In other words, the lawyers pretty well know how the other eight judges will decide, regardless, so if they can get that one swing judge to agree with them, they win the case, 5-4! Earlier, that "swing" vote was the first woman on the Supreme Court, Sandra Day O'Connor. However, since her retirement in 2006, the new "swing" vote is Anthony Kennedy. Both O'Connor and Kennedy are clear examples of the issue above: both were appointed by Pres. Reagan, a conservative, but both ended up having mixed voting records. Now, think on this. The Supreme Court, leading the Judicial Branch, is one-third of the federal government. With a 4-4 tie over the past twenty years or so on many issues, that meant the one swing vote was largely deciding things. So, if it seems crazy to you that one unelected person whose face and name most Americans would not recognize Judge Kennedy has been deciding many of the key cases and choosing the direction of the country, you are beginning to understand the bizarre situation of the recent Supreme Court. What is the Supreme Court like today (2016)? As mentioned, we have had basically a 4-4 liberal/conservative tie for a few decades. But, that brings us back to Judge Scalia.In February 2016, he died, thus upsetting the balance. As a staunch conservative, his departure now leaves a 4 liberal vs. 3 conservative situation. Pres. Obama tried to name a replacement judge, which may have given a guaranteed five-judge liberal bloc. Such a bloc could possibly control the court for years into the future. However, the Republican-controlled Senate refused to vote on the replacement, instead delaying the decision until after the 2016 election in their hopes of having a Republican name a conservative judge. Plus, that would give the voters a say in the replacement judge, because the direction of the Court would be a bigger election issue. So why is this an issue in the 2016 election? This brings us back to the start of this post. (Thank you, by the way, for reading this far.) The next president, Clinton or Trump, will get to name at least one Supreme Court judge on his or her first day in office, to replace the deceased Scalia. A conservative judge may revive the 4-4 tie, while a liberal judge would create a 5-4 voting bloc that would decide most important cases. Plus, when you realize that three of the other eight judges are age 78 or over, the next president might be able to name two, three, or even more judges in the next few years. Arch-liberal judge Ruth Bader-Ginsburg has been battling cancer for years. Pres. Obama has appointed two relatively young women to the bench, now ages 56 and 62; when you realize women generally live longer than men do, those two judges could be making rulings for decades yet to come. Big Brother is watching you: thanks to increasing technology, judges decide many privacy issues. So, not only is the Supreme Court a major issue in the presidential race, but it is for the thirty-some US Senate races too. Before you vote for a senator, you should know what sort of judge would that senator approve or reject, if given the chance. What are some key issues the Supreme Court has decided lately, and may decide again? Obamacare (aka "Affordable Care Act"): After this controversial law's passage in 2010, entirely with Democrat and no Republican votes in Congress, an amazing 26 US states went to the Supreme Court, arguing that the federal government has no authority to force people to buy a product (health insurance) and that their citizens would not have to comply with the law. Instead of being "affordable," many Americans have had to pay through the nose due to higher rates. Even this October 2016 news story warns that insurance plan prices will continue to skyrocket. Liberal judges want to force consumers to buy health insurance, while conservative judges generally do not. 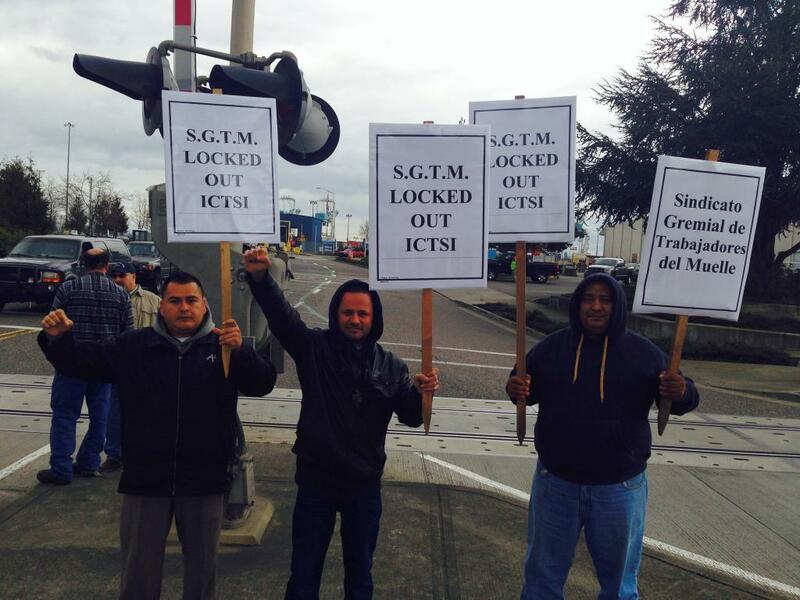 This controversial issue has been to the court several times. In one case, a conservative judge Chief Justice John Roberts sided with the liberals to keep Obamacare "on life support." In each case, the High Court kept Obamacare propped up. Second Amendment (Gun) rights. In District of Columbia v. Heller, the Court 5-4 agreed that the Second Amendment to the Constitution protects an individuals right to possess a gun for legal purposes, such as self-defense inside the home. Liberal judges are usually pro-gun control, while conservatives are usually pro-gun (Second Amendment) rights. Abortion. This contentious issue is an example of "legislating from the bench," as mentioned above. Until 1973, each state had its own law regarding abortion and legal protection for unborn children. But that year, the Supreme Court (7-2) struck down the laws of all 50 states in the controversial Roe v. Wade case, which ended legal protections for unborn children. Generally, liberal judges support Roe v. Wade, while conservative judges support the right of state legislatures (and ultimately the voters) to regulate abortion facilities and provide some legal protections for unborn children. Foreign laws. This is a more recent issue. Historically, the common-sense understanding was, the US Congress made laws that applied within the US, and judges interpreted those "Made in USA" laws. However, recently there is a move to "globalize" laws and some claim that foreign (non-US) laws should also apply in the US, or at least the judges should consider foreign laws and practices when deciding US cases. Liberal judges are more likely to consider foreign laws in their decisions, while conservatives would not. Who do Clinton and Trump say they will name as judges? As mentioned above, there is no guarantee that a judge will decide cases in keeping with the political ideas of the president who appoints him or her. Plus, there is no guarantee that Clinton or Trump will actually name judges as they have claimed they would; we can only go on their word, (for what you may think that is worth). However, all that aside, when asked what sort of Supreme Court judge they would appoint, Clinton said she would appoint people like liberal Judge Sotomayor, while Trump said he would name people like conservative Judge Scalia. Memorial Day--previous generations died for our liberties. In sum, the next president will serve for four years, or at the most eight, if reelected; however, judges make rulings until they retire or die, which could be decades. For some of us, that could be for the rest of our lives, or for much of the lives of our children or grandchildren. Will they rule in ways that defend our Constitutional liberties, liberties that previous generations died for, or will they slowly erode our liberties in the name of creating their version of a utopia, claiming "it's for our own good"? Judges have tremendous power. You cannot chose them directly, but you can choose the president who names them and the Senate that approves or rejects them. Ask Scott: How did Trump Win? This question comes to us by Facebook. A. Miffy, these are some great questions; thank you. In fact, your questions are so great, many Americans are still wondering the same thing! You asked two questions, but they are interrelated. First, let's discuss the election and why some Americans supported Donald Trump. Frankly, if you ask different Americans this question, you may get different answers, because of the responders' varying viewpoints. However, this is my explanation. Trump's win was a HUGE surprise for many people. Most polls for a long time had indicated Clinton would win, and win big. To show you what a surprise, this short video shows many entertainers, comedians, reporters and political figures all saying that Trump had no way to win, taken from the years, months, and even just days before the election. The video ends with CNN commentator (and no Trump fan) Wolf Blitzer on election night, calling state after state for Trump. Watch the video here. But this is not the first time there has been an upset in the race for the White House. In 1948, Democrat President Harry Truman was widely unpopular. He never had the gravitas of his predecessor, Franklin Roosevelt, and his salty tongue and short temper rubbed many people the wrong way. In fact, the 1948 polls showed Truman losing big to his Republican rival, Thomas Dewey. This picture, showing a beaming Truman holding up a newspaper claiming he had lost, has become a famous image from US politics. This video shows a collection of news commentators explaining how Trump had no way to win: even in the weekend before the election, many polls showed Clinton ahead. In fact, this article from a highly-regarded political website said that Trump would probably NOT pull off a Truman-like surprise win. Wow, were they wrong. There are several reasons for Trump's surprise win. 1. Unreasonable expectations: Let's go back to 2008. President won huge that year in what is called a "wave election." Candidate Obama made huge promises. This video even shows one excited supporter claiming "I won't have to sorry about putting gas in my car, I won't have to worry about paying my mortgage...." In other words, it seems as if she thought, with Obama in the White House, he would take care of her and all her problems would be over. There were stories about people passing out at Obama rallies, because they were so overcome by emotion. It was almost as if some people thought Obama were some kind of God-like figure. It was just wild. So, with hopes that high, it is reasonable that many later became disapppointed when Obama did not deliver a utopia. By 2016, the hyped-up optimism from 2008 had gone flat for most Americans. In fact, a whopping 70% of Americans believed "our country is on the wrong track." Normally, when high numbers agree with that belief on a poll, the party in power gets booted out. In contrast, when fewer than 50% believe that, the party in power stays in power. 2. Democrat overreach: This also goes back to 2008. In that "wave election," not only did the Democrat Party win the White House (with Pres. Obama), but they also made HUGE gains in the US Congress. For example, the US Senate only has 100 seats (two per state), but by the summer of 2009, the Democrats had a whopping 60 of those 100 seats. In other words, by controlling the Executive and Legislative branches, the Democrats were able to push through most all of their goals. Republicans could complain, but were essentially powerfless to stop anything. As a result, the Democrat leaders probably became overconfident and pushed through many ideas and programs that many Americans found extreme, and in some cases, offensive; so, starting with the next election, in 2010, and followed in 2012 and 2014, Republicans gradually picked up seats, and 2016 was a part of that bigger trend. Many are shocked to learn that the Democrats have lost hundreds of offices all across the US during the Obama years, putting them at their weakest point since the 1920s! This NPR article explained the trend even BEFORE Trump won in 2016. 3. Fed-up people/Undecided voters: Many voters did not like EITHER candidate, so they voted for the one they hated LEAST. I was watching NBC News elections returns that night of Nov. 8, 2016. One survey reported 60% of voters did not like Trump, but 54% did not like Clinton either. And since most surveys have a "margin of error" of 3-4 %, that means both candidates were equally unpopular. Interestingly, of the 18% of voters who did not like EITHER candidate, they voted for Trump 2 to 1. That's why many people called this a "Rejection Election." Many are upset with how the US and its government has been running, and are mad at both the Democrat AND Republican Parties, so they saw a vote for Trump as a chance to "drain the swamp" and make big changes in Washington. Plus, since Trump was an "outsider" with no political experience, they saw him as the man to clean-up America's political mess. Many saw the June 2016 Brexit vote as a sign that Trump might win later that year. With Brexit, you had most of the media and political elites wanting and predicting that most Brits would vote to remain in the EU. However, in a huge surprise, many voters in England's industrial heartland voted to leave, thus making the Brexit vote successful. 4. Scared people: In addition to many voters being angry, disappointed, and/or disgusted in 2016, many were also scared. Many find life in modern America frightening today: people worry about job losses, economic problems, drugs, terrorism, expensive healthcare, bad schools, crime, out-of-control and out-of-touch government, lack of morals, corruplt culture, national debt, illegal immigration...the list goes on and on. When Trump spoke again and again about "make American great again" and "build the wall," he spoke to the fears that millions of Americans had. Furthermore, since economic anxiety has been running high since around 2007, many saw the successful businessman and rich man Trump as the right person to fix America's financial woes. Many powerful voices in the media, education, Hollywood, and the Democrat Party laughed at Trump's promises, but they are not laughing now. Speech writer for President Reagan, Peggy Noonan, predicted and explained this trend nine months before the election in her article, "Trump and the Rise of the Unprotected." Basically, she said some Americans had safe, comfortable positions in 2016: politicians, professors, reporters, entertainers. Though powerful and with big voices, they are a tiny minority. In contrast, millions of American live in fear and feel vulnerable: factory workers, single parents, farmers, recent college grads with no decent job, retirees, etc. Those "unprotected" millions felt betrayed by the status quo and, when they heard Trump promise to fight for the little guy, they took him at his word. It's interesting: in the months before the election, I cannot remember ANY time a news reporter or commentator mentioned this historical fact. However, on the morning after the election, I heard the news anchor on National Public Radio (NPR) mention this case, almost as if he were desperately trying to explain how Trump had won. 6. Two Americas: On election night I was watching the returns on NBC, and one commentator, groping to explain Trump's surprise win, put it this way: "We have overlooked rural America, the Heartland. Rural America just screamed, 'Listen to us!'" Many people for years have said there are "Two Americas," and that is partly true. (Some wise guys say, "Of course there are two Americans: North America and South America!") But seriously: The USA has the coastal areas: mainly the East Coast from Washington DC up along the Atlantic coast to New York and Boston, and then we have the Pacific Coast: Los Angeles, San Francisco, Oregon, and Washington State. These areas are largely the "influence makers" in the US: Washington is the political capital; New York is the financial and news capital, Los Angeles (with Hollywood) is the entertainment capital, and much of the rest of western California is the cultural capital. (This is because many ideas, fads, and trends start in California and gradually, often with constat pushing from Hollywood, spread across the USA.) But even though these coastal regions have outsized voices and influence, they are relatively small in population, and tiny in land area. 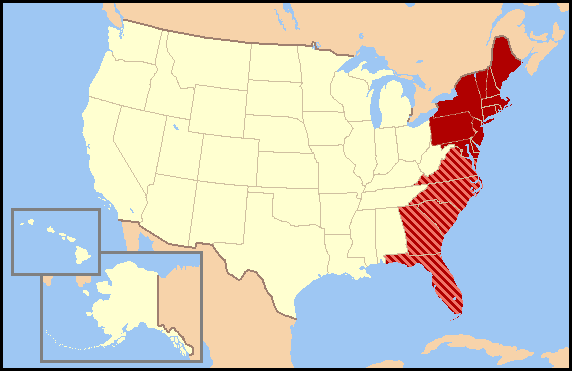 In contrast, much of the US landmass lies between the two coasts. Though not as glamorous, rich, or influential as the coasts, many see this area as the "real America," the "Heartland" of the USA. Some disparagingly call it "Flyover Country," because they just see it as the big but boring area you have to "fly over" when you travel between two coasts. 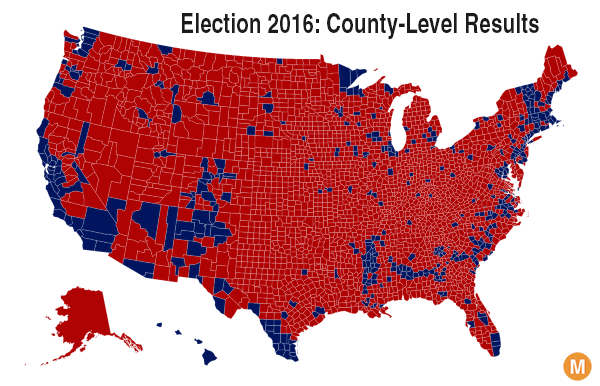 However, in the 2016 battle between the "Flyover Country" vs. the Coastal Elites, almost the entire middle chunk of the country howled with a vengence, and gave the election to Trump. 7. Clinton overconfidence: Hindsight is 20-20, but looking back, we see that Clinton and her allies were overconfident. They seemed to have this mindset: "Once Hillary's name is on the ballot, most ALL of America's women will automatically vote for her, just because she's a woman. Plus, since her husband was president for eight years and she was set to win in 2008, until Obama came out of nowhere and took it away from her, it's her turn. She deserves it." Many call this an "entitlement mentality." Example: the US state of Wisconsin is, historically, a heavily Democrat state. The number of times Hillary Clinton campaigned there in 2016? ZERO! Why? She thought she "had it in the bag." I guess she thought, since she had a "D" behind her name, she would win Wisconsin automatically. But, she did not. She was the first presidential candidate since 1972 to not campaign there at all. Clinton's last-scheduled rally of the campaign was in Philadelphia, Pennsylvania, a swing-state. But as that rally was ending, and with polls still tight in many places, they made a last-minute decision to add a rally in North Carolina, around midnight, in hopes of putting the Tarheel State in her column. After the election I saw a photograph of President and Mrs. Clinton on their plane bound to North Carolina, all smiles and celebratory champagn glasses in hand. For me, that picture was the perfect metaphor for the election; one is to celebrate after the victory, not before. At the end of the day, Trump won by carrying three states that had voted Democrat for years: Pennsylvania, Michigan, and Wisconsin. He won each of those three narrowly, but since the Electoral College is "winner take all," those three states put him above the 270 mark and put him in the White House. In the days before the election, most news reports and polls still showed Clinton winning comfortably. However, I remember hearing new stories just in days before the vote that said Trump was campaigning in Michigan and Wisconsin. "Michigan and Wisconsin?" I thought. Either he's crazy, or else his polls are telling him something the news people don't know. In other words, Michigan and Wisconsin have voted Democrat for president for decades, so if he was truly going to lose there, visiting would be crazy, because he should visit "battleground" states instead, like Florida or Ohio. However, his last-minute decisions to go there showed that he thought he actually had a chance to win them, which in fact he did. Now, to your second question, about Secretary Hillary Clinton's emails. Barrels of ink have been written about this, but in a nutshell: First, when Hillary Clinton was US Secretary of State (a highly powerful and prestigious position), she set up a home-made email server and ran many of her emails through it. This was stricly illegal. As a high-ranking US government official, she was supposed to conduct all her email business through her official, State Department email address. No one can read Clinton's mind, but many suspect she used her personal email for official business, so she would better be able to keep some of her messages secret. In other words, government emails can someday be made public, thanks to the Freedom of Information Act (FOIA). However, if she could put her emails on a private server, then she could keep them from ever becoming public. Imagine if a public official had some sensitive, work-related paper documents that could someday be embarrassing if made public. Would it be fair if that official simply took all the documents home and stored them in old shoe boxes? If a reporter or someone else wanted to use FOIA to see them, imagine if the official said, "no, those papers are in my basement at home in shoe boxes, so you can't see them, because they belong to me now." Of course that would be nonsense. Those documents would still be official, despite being stored in a private basement. What's more, official papers stored in a home could be stolen or damaged by a fire or flood. High-security documents need to be handled securely, whether on paper or email. Second, as Secretary of State, many of her communications were top-secret and highly sensitive. So, by putting them on a "home-brew" server, they could be easily hacked by foreign governments, and the US FBI director later said yes, they probably were hacked by foreign, unfriendly governments. (To be fair: the US spies on other countries too, friend and foe. It's part of the international scene.) So, being so careless with top-secret emails not only jeopardized US national security, it also endangered US agents or our informants overseas. If hostile governments or groups could find out who are agents are, they could easily jail or kill our helpers. So, the lax security around emails could actually mean life or death for some people who trusted us enough to work with the US government. Third, the FBI investigated Clinton's email scandal and said she had been basically careless and sloppy, but had had no "bad intent," so they let her off without legal punishment. Clinton getting off "scot-free" also angered many Americans. There have been other government officials or military servicemen and women who had been careless or dishonest with classified material at other times...and they went to jail. So Hillary getting off without punishment furthered the perception that many Americans had: there is a serious double-standard in the US. Laws (and punishments) apply only to the "little people," while powerful folks like the Clintons could break the laws any way they wanted, and always walk away untouched. Simply put, many people thought of Hillary Clinton as basically dishonest. Going into the election, I heard one NBC poll that claimed "just 11% of Americans describe Hillary Clinton as 'honest and trustworthy.'" So, this email issue just furthered that suspicion. If she had been dishonest about some vague business dealings or financial issues, that would be hard for many people to understand. But since email is now such a common and popular technology, it is something that almost everyone can understand and relate to. At the end of the day, Trump's repeated references to "Crooked Hillary" stuck and took their toll. Election 2016 is history, and Donald Trump sits in the White House, while the Clintons are in an early (and unwanted) retirement. Do you have a question about the English language or life in the USA? Contact Scott, and maybe your question will be the subject of his next post!